Operating Governance is about how the organization makes, tracks, and enforces key decisions. It’s the “operating system” of the organization. Unlike Corporate Governance, which divides power and responsibilities between the board, management, and other stakeholders, Operating Governance focuses on who decides what, how they make those decisions, and when those decisions should be made. It also includes the metrics which score the outcomes of decisions. Operating Governance defines executives’ power — up, down, and across the organization. Operating Governance does not encompass every decision — only the key ones. The key decisions are those which most affect elements of the strategy: choices shaping the organization’s ability to compete for targeted customers, and to win in the chosen markets. Certain fundamental decisions are almost always key, such as who controls hiring, performance evaluation, sales quotas, and budgets. Others may be less obvious but no less crucial — for example, who defines the market segments; or who enforces technical standards, and how. How key decisions are made is a process — many times, that process may be informal, one-off, and only tangentially supported by data. However, more effective decision processes are thought-out, consistent, repeatable, and informed by appropriate data and analysis. And when they are consistent, they can be improved, leading to better outcomes. It’s not sufficient just to make good decisions, though — it is as important to be able to track the outcomes of strategic choices, as well as actions taken to implement those decisions. Appropriate metrics should be agreed on, and targets specified, when the decisions are made (or as soon as possible). Finally, it must be in decision makers’ interest to follow through — so incentives should be attached to the metrics. Incentives can be positive (for example, more resources) or negative (for example, fewer resources). 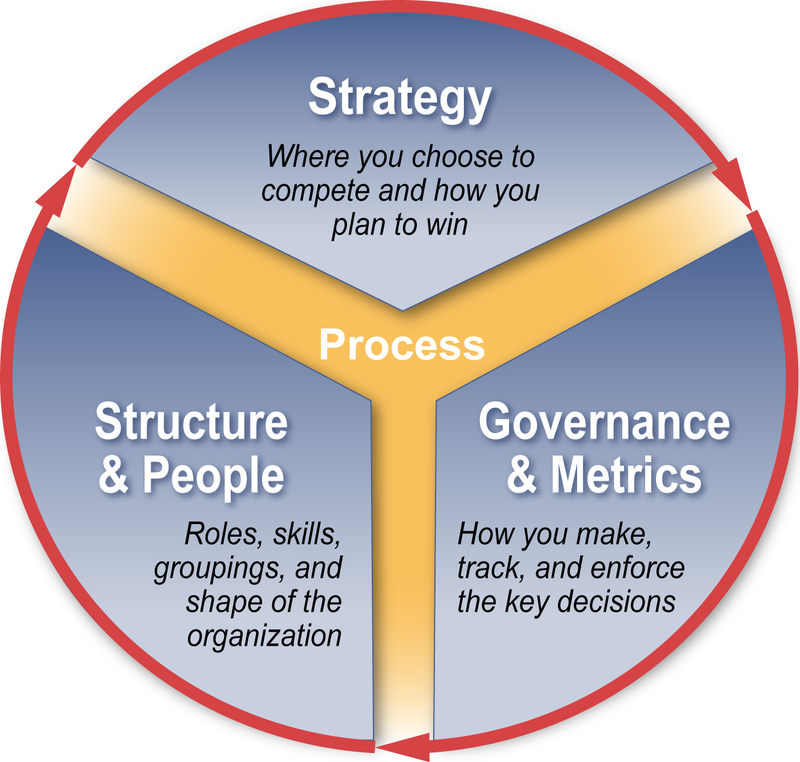 Strategy is most likely to succeed when all of these elements of Operating Governance and Metrics are defined and coherent. Organizations may muddle through with only some of them addressed, but they rarely thrive for long in changing business environments. Either of these may come into play when companies are involved in partnerships or outsourcing arrangements, either to operate a process or deliver a function. It’s especially important to be explicit about who decides what, when, and how, because the assumed decision rights may be very different in each company. When a business process is of paramount importance (for example, rapid product development when the business strategy relies on bringing products to market faster than competition), it can be valuable to define the governance of that process — especially when success requires the collaboration of multiple functions and/or operating units, within or even across company boundaries. In many businesses, functional organizations themselves (e.g., marketing, manufacturing, finance, IT), can become very large and diverse, making it challenging to run efficiently and responsively. Even a well-run functional organization can benefit from governance assistance when new capabilities are demanded by the business strategy; when new tools or processes have been deployed; when you must collaborate with a partner to deliver certain functional capabilities; or when you have outsourced certain activities, and must ensure they are delivered seamlessly as part of the function.